The Red Bluff Bull & Gelding begins today at the Tehama District Fairgrounds in Red Bluff.Â The event will run through Saturday, February 1st with events going from early in the morning to late in the evening. Today, January 28th, will be a light day with a breakfast and sifting and grading of bulls.Â Tomorrow, the activity really gets going.Â Sifting and grading continues, but it is joined by the trade show, working stock docks, and the Buyer & Consigner Dinner. On Thursday, the horse events are in full swing with geldings and mules being shown at halter and competitions in dry, trail and cattle.Â At 7:30pm, the conformation horse will be selected and the working stock dog competition will take place.Â On Friday, team roping, cutting, snaffle bit, hackamore and stock horse contests will take place including the selection of the Craig Owens Ideal Ranch Horse. At 5:30 pm on Friday the ultimate event at the Sale for horse lovers will take place.Â The sale of quarter horse, paint geldings and saddle mules.Â Itâ€™s $10 to get in and while youâ€™re there, take advantage of the Tri-Tip BBQ also going on for $10 a plate. Saturday returns to the bulls with the event commencing with Red Bluffâ€™s Buckinâ€™ Best Bull Riding.Â A dance follows the bull riding at itâ€™s $35 at the door. Throw in an art show, wine and cheese show, clinics and demonstrations and you have yourself a chock-full 4 days.Â Entry onto the grounds is free.Â Â Tehama District Fairgrounds is located 650 Antelope Blvd in Red Bluff. You can reach the fairgrounds by callingÂ Info@tehamadistrictfair.com. 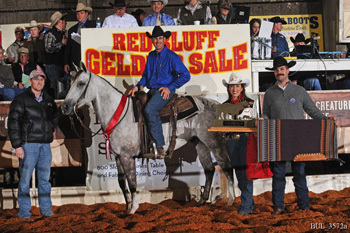 Â For more information, please visit the Red Bluff Bull & Gelding Sale atÂ www.redbluffbullsale.com.